Woke up at 3.15am again but managed to get straight back to sleep and awoke again at 5.15am. Got a message to say that the vet was coming out to put my dog to sleep  FaceTimed him and went and sat on the beach with a coffee, watching the sunrise until I received the final sad news. Today was checkout day so after another coffee we started the relatively easy task of packing up our stuff. I'd packed individual cases with the different hotels at the start of our holiday in mind so we didn't have much to throw in the case. 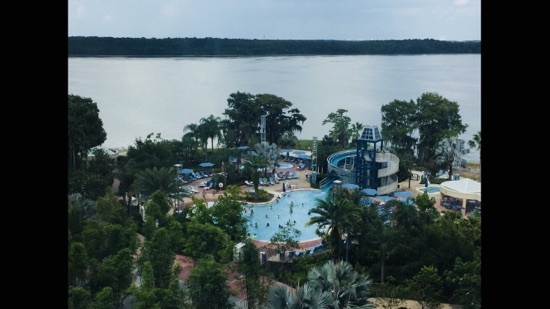 We drove to bay lake tower and checked in, it was only 9am so we drove to Walmart at the end of old lake Wilson road and bought out supplies for he rest of he holiday. We spent $85 and got 80 bottles of water, some beers and &lsquo;Rita's for the room, crisps, cereal, milk, cookies, pop tarts and some fruit. 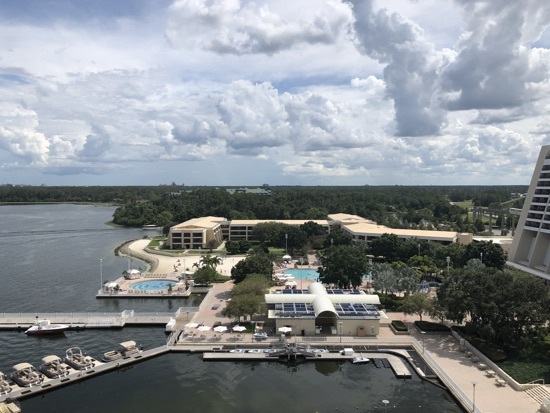 We got back to bay lake tower and left our refrigerated food with bell services before heading over to the contemporary for our breakfast/brunch with chef Mickey. We checked in half an hour early at 11am and our pager went off about 5 mins later. I had a pina colava to drink and our server also brought us each an orange juice. 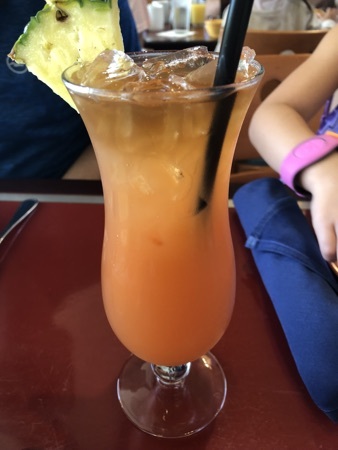 DH had a captains mai tai. 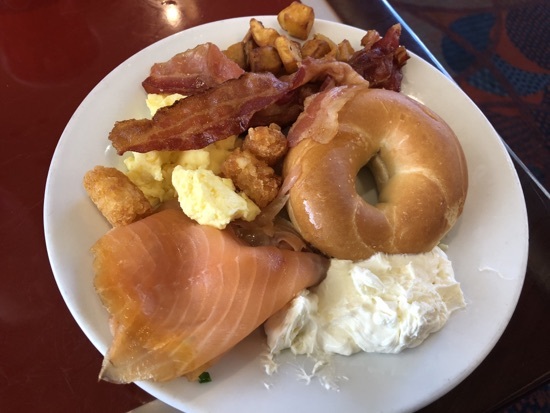 We helped ourselves to a hot plate of food from the buffet, i had a bagel with smoked salmon and cream cheese, scrambled egg, breakfast potatoes, bacon, tater tots. 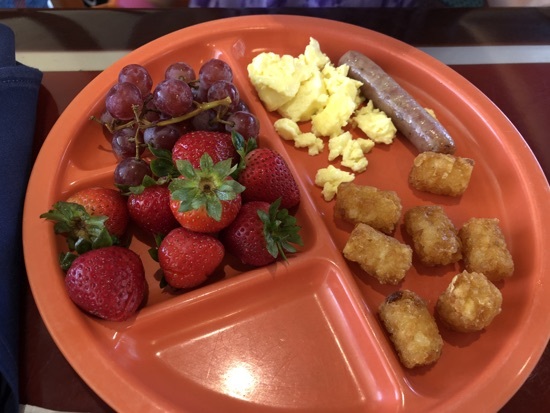 Dd had some grapes and strawberries, tater tots, scrambled egg and a sausage. 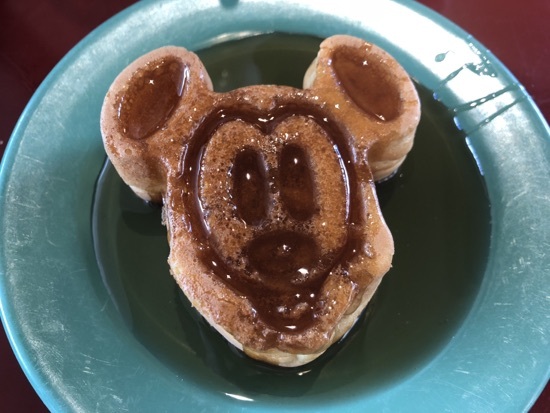 I then had a Mickey waffle and maple syrup. 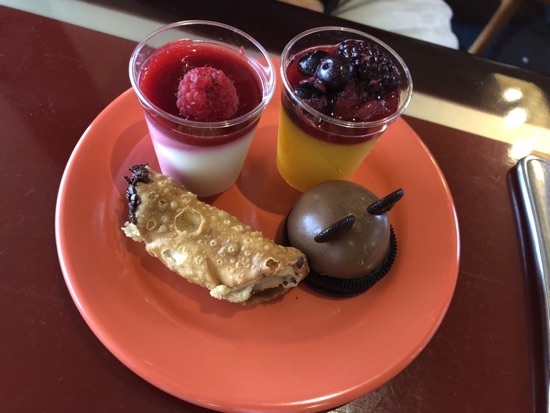 DH tried a few of the other deserts on offer, there was mango/passion fruit panna cotta, raspberry panna cotta and a cannoli, They also had a self serve ice cream machine with a variety of toppings and sauces, including chocolate chips, peanut butter chips, sprinkles, gummies, smarties, cherries and marshmallows. This was $25 for children and $42 for adults. 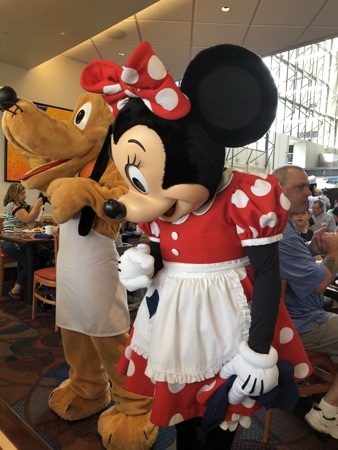 Quite expensive especially for breakfast but DD loves it and it's a great way to see Mickey, Minnie, Donald, goofy and Pluto. After breakfast we walked over to magic kingdom where we did at the Tomorrowland transit authority, Tomorrowland speedway, seven dwarfs mine train, Peter Pan and the matter hatter tea cups. 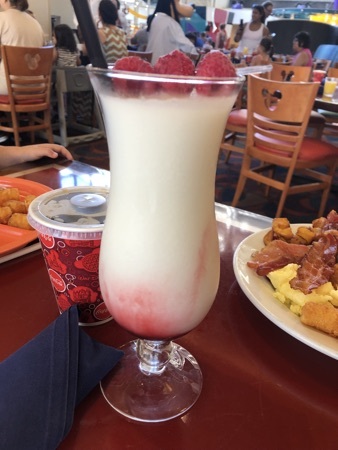 We stopped off at Gaston's Tavern when we got a le fou's brew to share using a snack credit. 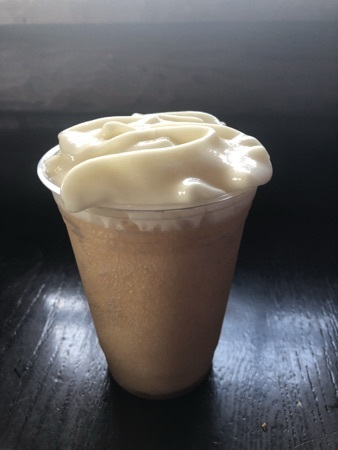 This is frozen apple slush with a hint of marshmallow topped with passion fruit foam, absolutely delicious and so refreshing. Great use of a snack credit as it should have been $5.69. We unloaded the car and unpacked, making ourselves literally at home for the next 12 nights. 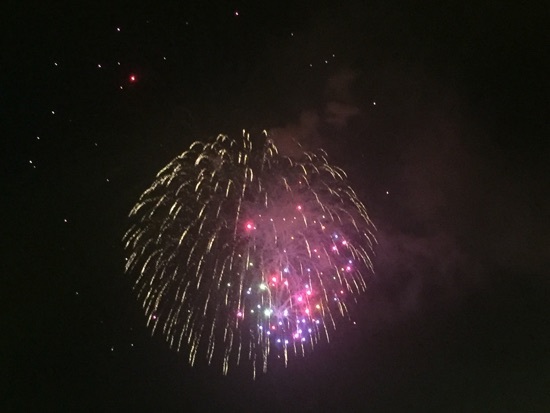 We can't wait to sit on the balcony having a drink watching the electrical water pageant in the evening. We had 2 hours before our dinner reservation at California grill so we threw on our swimming stuff and went down the the pool as DD was too excited to wait to check it out. The pool wasn't too busy and DD loves the slide, she was able to go up and down it on her own as well which she loved! After an hour or so we went back to the room to get ready for our evening meal at California grill. We walked over and checked in and were taken straight up and seated straight away. We were at the table next to the one we sat at for brunch which had a great view of the pass so we could see all the food getting finished off and waiting to go out. 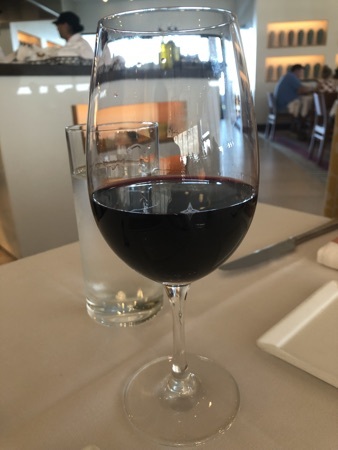 For drinks DH had a glass of red, chappellet at $16, which he said was really good. 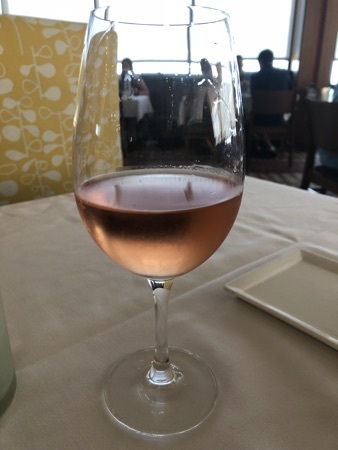 I ordered the la crema rosé which was $16 and also a very nice glass of wine. Dd had a coke, why break the habit of a lifetime?! We don't but coke at home so this is abit of a novelty for her. 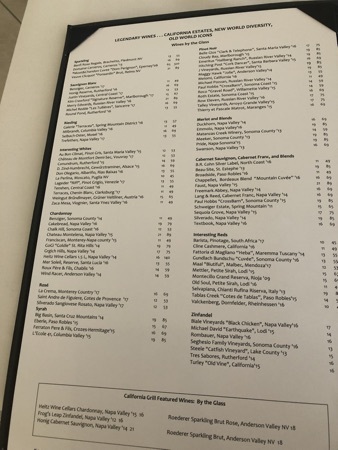 They have a huge wine list to choose from here and almost everything is allowed on the dining plan. 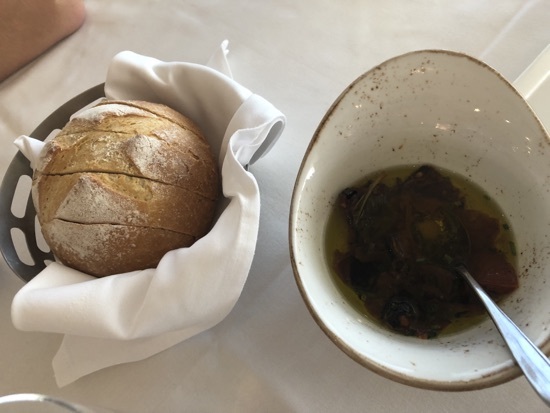 Our server then brought us some crusty bread and a sundried tomato and olive oil dip. Admittedly I was disappointed at first when I saw the oil as I've always loved the butter with sea salt here but the olive oil with tomatoes was really good! 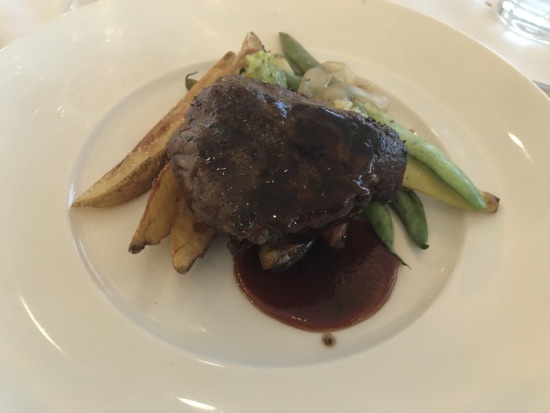 Again for our mains DH and I ordered the same, oak fired fillet of beef cooked medium rare, $51. This came with a bbq sauce and potato wedges, green beans and onion cooked in garlic. I was slightly underwhelmed with the side this came with as I've had some lovely accompaniments in the past but they were nice enough. The real star here is the piece of meat. 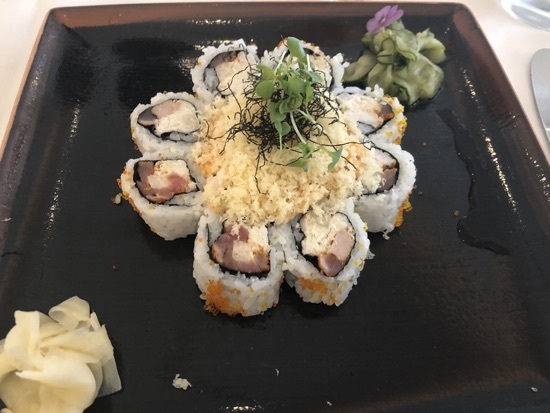 It was cooked absolutely perfectly and every mouthful was melt in the mouth and delicious. There was not a single piece of fat in sight and we both cleared every single scrap off our plates. Dd chose the kids cheese pizza, $10, and really enjoyed this, particularly after i cut it up and she ate it with her chopsticks, she finished all of this so it must have been good. 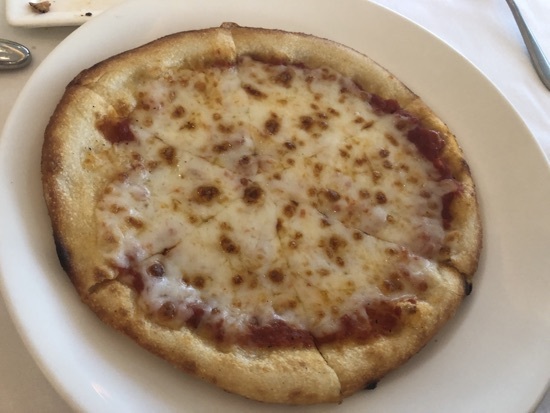 She's usually a Mac cheese monster and this was also on the menu so the pizza was a surprise choice! To complete the set DH ordered the same as me for dessert. 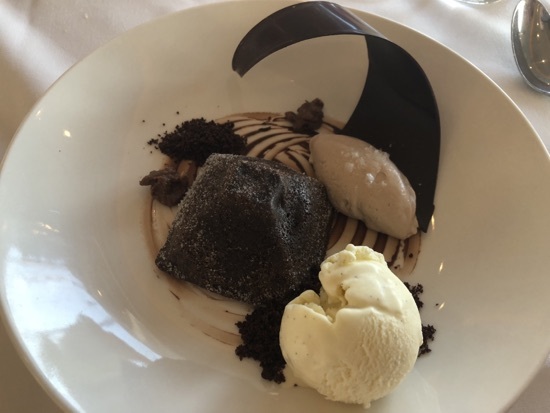 We both went for the warm valrhona chocolate cake, this was $14 - Oh my goodness this was devine! The chocolate cake is rich and gooey and then you get to the centre which is filled with runny chocolate sauce. The vanilla ice cream is really good and the milk chocolate panna cotta has sea salt on top giving it a salty kick. There was cashew clusters and a chocolate curl to finish it off, again we cleared our plates. 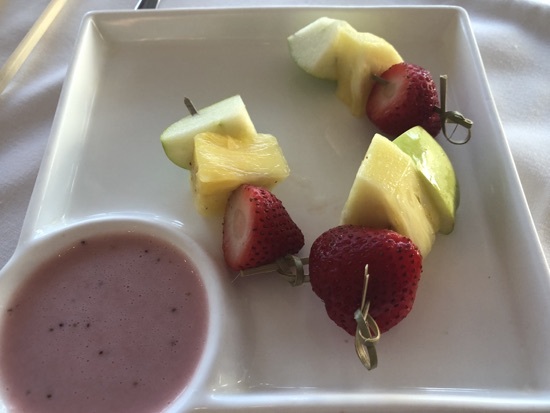 Dd had the fruit kabobs at $6, this was 3 skewers with strawberry, pineapple and apple served with strawberry yoghurt to dip them in. She loved this and ate it all. We used our remaining meal credits and paid cash for the rest. Our total should have been just over $250. This is an expensive meal but it's truly spectacular, the food and service are absolutely worth it. 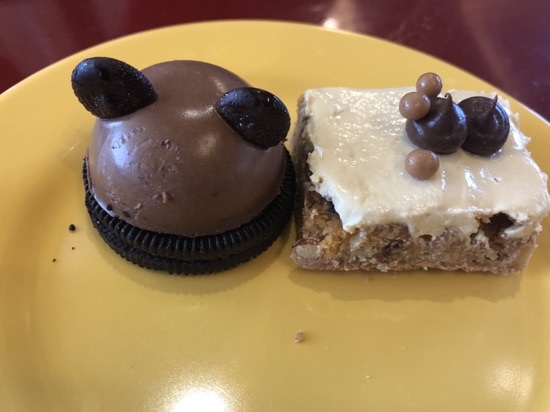 We made our way down to the Contempo cafe where we had the small matter of 8 snack credits to take care of. 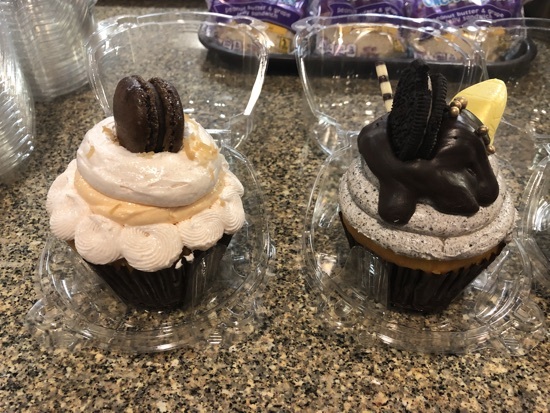 We bought 1 of each of the 4 cupcakes, not entirely sure what each of these are at the moment so these will be explained as we eat them for breakfast in the coming days. 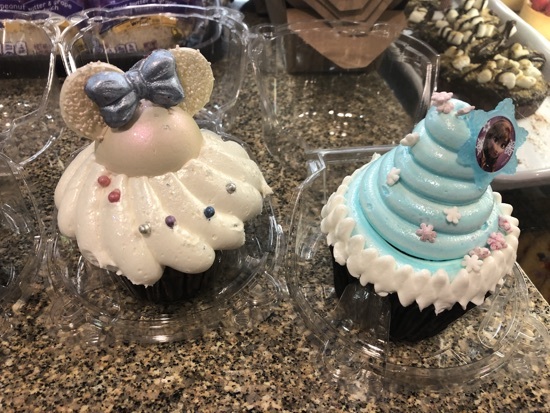 These were $5.99 each. Dd then picked some sweets from the ship with the remaining 4 snack credits, she got some cotton candy and 3 bags of goofy candy company sweets, these make great gifts for her friends when we get back home. 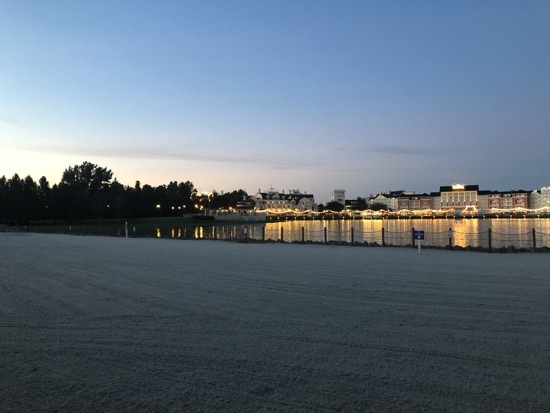 I was absolutely shattered after my early get up and went back to our room, I fell asleep watching the Epcot fireworks out of our window. DH took dd up to the top of the world lounge to watch happily ever after at 8.55pm. She loved this! New Photo Added by missdopey - 21 Aug 18 9:11 PM. The view from your new room is great. Did you have a good room at the Beach Club Villas - do you put in a specific room request? More lovely food today especially the fillet of beef and your dessert (again!). How funny that your daughter used her chopsticks for the pizza!